As we slide towards the end of Gotham, I feel that things are a bit slow. Ruin had a lot going for it: a nice bit of comedy, some good performances and yet something about it left me cold. I think it has to do with various plots spinning to where they seem interruptions more than a cohesive whole. That and killing defenseless people. The aftereffects of the Haven bombing continue to resonate. 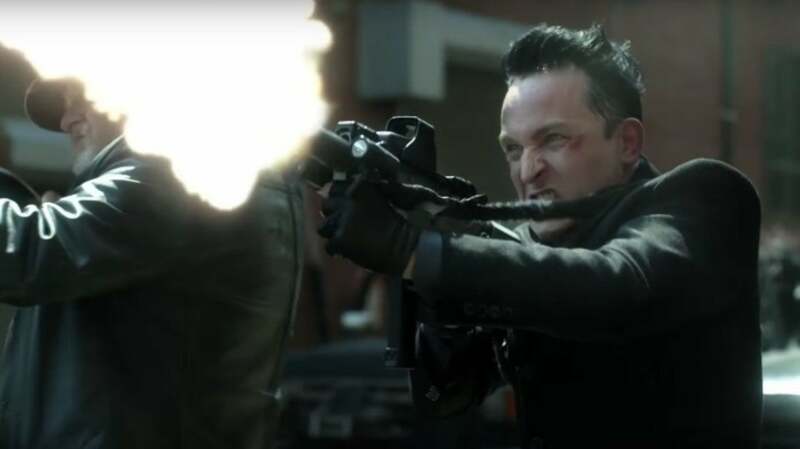 Even the generally evil Penguin (Robin Lord Taylor) and Barbara Kean (Erin Richards), who never shrink from killing people in cold blood are appalled at the slaughter of noncombatants. Captain Jim Gordon (Ben McKenzie) is always appalled at all killings, but now Pengy and Bonkers Babs in their own way are going to help find the Haven bomber. Pengy will bring his mass arsenal and Barbara will withhold from killing Pengy and bring what information she can. We even get another unlikely ally in Edward Nygma (Cory Michael Smith), who is still struggling to piece together what is going on with him. He has a clue of sorts in his Memento-type writing but finds that to get that information he needs to enter the Gotham City Police Department. There, he finds Lucius Fox (Chris Chalk) has need of him to investigate. "The second smartest man in Gotham needs my help," Ed says. One wonders who he thinks is the smartest. They do find that the bombing is not a real bombing but a rocket propelled grenade launched into Haven. Who has that firepower, and why would they target civilians? A road seems to lead to Victor Zsasz (Anthony Carrigan), who is still the comically quippy figure he's always been. He denies doing the bombing on the fact that if he had, he'd openly take credit for it. Gordon and Detective Harvey Bullock (Donal Logue) take him in, but Penguin wants him for his own act of vengeance. Using Zsasz as a scapegoat, he puts him through a kangaroo court where Pengy serves as judge and prosecutor, with the obvious result of Zsasz found guilty. Gordon won't stand for this funny business and saves Victor, but he lets him go even after challenging Zsasz to a shoot-out. Victor for once decides that discretion is the better part of valor and leaves. Ed finds his mystery clue leads him to a secret witness who tells him it was Edward himself who launched the RPG. Ed promptly tosses the old wheelchair-bound lady out the window, but not after having flashbacks of Penguin telling him he'll fix him. In our really minor subplot, Bruce Wayne (David Mazouz), along with Alfred (Sean Pertwee) continue their search for Selina Kyle (Camren Bicondova). Selina is determined to find Jeremiah Valeska (Cameron Monaghan), and she appears to stab him repeatedly. It takes all of Bruce and Alfred's strength to save her from both Jeremiah's minions and herself. It might be that Ruin had such a major story (the uncovering of the Haven bomber) that the Bruce/Selina story felt almost jammed in. For whatever flaws with the Nygma storyline, at least that ties into the overall Ruin narrative. I cannot say that for the Bruce/Selina subplot. Even that I could overlook if I actually thought Jeremiah was dead, but I'm convinced that he'll somehow come back. He's done it before, and the way it came across it seems so wildly anticlimactic. I cannot believe Jeremiah would have such a simple death. This is especially true given how Ruin gave itself over to being a bit camp with our "not-Joker" (as far as I know no one has ever referred to Jeremiah by this sobriquet). As he and Ecco (Francesca Root-Dodson) have their danse macabre while the "not-Harley Quinn" gives her "puddin" information, one senses things are being played up to an almost comical level. I can concede however that Root-Dodson is doing a great job, her description of their enemies as "Bruce Wayne and his sidekick Curls" is clever, as is her quip wondering whether Bruce is "Curl's" sidekick or the other way around. Carrigan too is a delight to have back as our almost childlike Victor Zsasz, almost totally unfazed by anything. After quipping if Gordon and Bullock would do a strip search to see if he's tallied his body with all the Haven people he's allegedly killed, he adds a most curious line after Detective Alvarez (J.W. Cortes) leaves. "I'd let Alvarez do (the strip search). He's handsome". While yes, Alvarez is handsome, it makes one wonder why Pengy went after Edward Nygma when Victor Zsasz seemed at least open to the possibility of 'an understanding'. Chalk and Smith worked well together as Lucius and Edward to where one almost wishes Gotham had them in their own spinoff, though I do wonder about Chalk's hairdo. Taylor's Pengy continues to be great, even if here he came across as more bonkers than evil. He still found a bit of comedy when ruining the GCPD's efforts at a stealth raid, but in his rages and megalomania Taylor makes Penguin into a mix of menacing and mirthful. I've always been wary of the violence on Gotham, and the bit where Nygma tosses an old wheelchair-bound lady out the window just does not sit well with me. I also thought it was completely idiotic for her to tell Nygma anything. Didn't she think this mass killer wouldn't kill her too? Seriously, knock him out harder. I also wasn't overwhelmed by Alfred's fortuitous rescue of Bruce, Bonkers Babs' fortuitous lack of killing Pengy (I could have bought the shock of the bombing disoriented her, not her odd sense of moral qualms stopping her) and her and Gordon's brief embrace. I know Jim has needs, but Barbara? Finally, the Memento-type ripoff where Ed writes his clue on his hand was a bit much for me. Ruin wasn't bad and had some good things in it. However, I found it on the whole less than the sum of its parts.